Today was a very quiet day - cool and sunny. I did a survey of my back yard, which my landlady had cleaned up, taking out all the dead weeds between the trees so the dusty soil is exposed. I always get a little nervous walking there because of snakes or other crawly things in the underbrush, but it's dry season now so all the creep crawlers have the good sense to go underground. I finished "Inda" by Sherwood Smith. I liked it towards the end because the plot started to capture me but the beginning was slow going. This is one of the books I really wanted to like, even though I don't care much for fantasy - but it was worth it. The end of the book, once the sheltered MC is banished, was more interesting. Smith does some great world building and I enjoyed how gender roles and the emerging sexuality of her characters developed. I'm trying "Water for Elephants" next, and when I go out for my morning run, I've started to listen to "Contact" by Carl Sagan. Last week, I also finished "A Fine Balance" by Rohinton Mistry. I think this is in my list of top ten for the year. He captures a year of hope and misery, which takes place during "The Emergency," a bad time in India's modern history. The characters, their developing friendships and the tragedies, are all well written. It has the sweep of a Bollywood film too - especially when everyone comes together at the end. Some reviewers said that this book was too 'raw,' but I felt it was India - the most sublime and the most horrible. 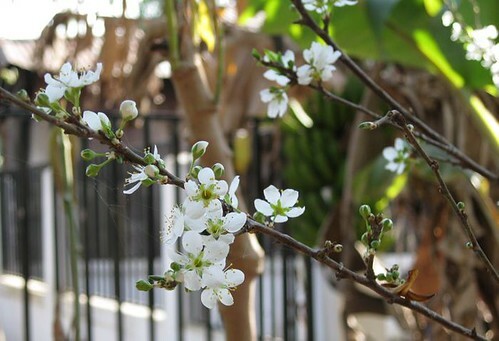 plum blossoms, originally uploaded by c_p_lew.